A timeline of significant aviation events through history from 1783 to 1940. Joseph (1740-1810) and Etienne (1745-1799) Montgolfier gave the first public demonstration, at Annonay, France, of a hot air balloon rising up into the sky. JAC Charles (1746-1823) demonstrated the first hydrogen balloon flight, when an un-manned balloon flew from Paris to Gonesse - a distance of 15 miles. JF Pilatre de Rozier, as the first civil aviation pilot, and the Marquis d’Arlandes, as the first passenger, flew 5.5 miles in a balloon across Paris - a flight lasting 25 minutes. The first flight in Britain of an un-manned hydrogen balloon took place at Moorfields, London, when Count Francesco Zambeccari launched his balloon from a friend’s house. It came down 2.5 hours later near Petworth, Sussex - a distance of 48 miles. JAC Charles ascended from Paris in a hydrogen filled balloon and landed at Nesle - a distance of 27 miles and the first human ascent in a hydrogen balloon. Vincent Lunardi (1759-1806) accompanied by a cat and dog, flew in his hydrogen balloon from the Artillery Ground, Moorfields, London to North Mimms, Herts where the cat was released, he then made his final descent at Standon, Ware in Hertfordshire. James Sadler (1751-1828) rose to an estimated height of 3,600 feet over Oxford in a hot air balloon with a cubic capacity of 38,792 cu ft.
Blanchard and Jeffries in a hot air balloon crossed the English Channel from Dover to the Forest of Guines, near Ardres, France. With the formation of the Compagnie d’ Aerostiers [Balloon Company] on 2 April, the first captive hydrogen balloons used in anger during the French Revolutionary Wars at the battle of Fleurus, in Belgium. The first man to descend successfully in a parachute from a balloon was Andre Garnerin, in Paris (Winchester, Vol.1, p.11).1816-1850 - Sir George Cayley (1773-1857), was the first British scientist to pay serious attention to the problems of mechanical flight and try to explain the fundamental principles of flight. John Stringfellow (1799-1883), took out patent No.9478, for a ‘aerial steam carriage’ [large steam-powered monoplane]. In June 1848, he assembled his powered model which he successfully flew inside a disused lace factory. This was the first time, that a powered aeroplane had flown. Archibald Douglas first proposed the use of a captive balloon for the British Army, but his ideas were rejected. 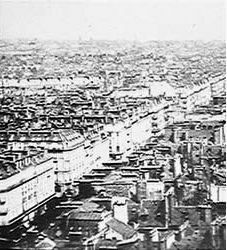 The first known aerial photograph was taken by the French photographer and balloonist, Gaspar Felix Tournachon, nicknamed "Nadar". During the American Civil War, the Federal Army used observation balloons during the Battle of Fair Oaks. A British officer, Captain Beaumont of the Royal Engineers, was attached to this balloon unit. Henry Tracy Coxwell (b.1819) and James Glaisher (b.1809) made their record ascent to seven miles (37,000 feet). Aeronautical Society founded (later called the Royal Aeronautical Society). 63 balloons were used during the siege of Paris to carry messages, carrier pigeons and people. As a result of experience gained during the Franco-Prussian War, the Royal Engineers Committee formed a sub-committee composed of Captain Beaumont, Captain Grover and Sir Frederick Abel (the chemist to the War Department), to study the employment of balloons in a reconnaissance role. Captain Beaumont had been an observer during the American Civil War and in particular during the Battle of Fair Oaks where balloons had been used for observation purposes. On returning to England in the following year, Beaumont had set up an informal balloon committee with Sir Frederick Abel. This later became an official Balloon Committee until absorbed into the Advisory Committee on Aeronautics. The Balloon Equipment Store moved from Woolwich to Chatham where it became the School of Ballooning. Colonel JLB Templer, introduced the use of goldbeaters skin for the making of balloon envelopes, engaging a family named ‘Weinling’ who knew the secret of piercing the skins together. Three balloons were sent out to South Africa with Sir Charles Warren’s Bechuanaland expedition. Templer took three balloons to the Sudan, and was present at the engagement at Hasheen. Adolf Hitler was born at 6:30 p.m. on April 20th, 1889 in the small Austrian village of Brauunau Am Inn. His father Alois had changed his name from Schicklgruber to Hitler to mask his illegitimacy, actually intending his name to be Hiedler, but through a spelling error it became Hitler. Adolf's mother, Klara Pölzl, was Alois' uncles' granddaughter. Considering the weight Adolf Hitler placed on requiring the German population to prove their family trees (making it a life and death requirement) his own family tree was very confused and a constant source of embarrassment for him. There is even a strong possibility that his father was fathered by the 19 year old son of a Jewish family that Alois' mother had been working for! As a result of Army manoeuvres at Aldershot where balloons were being used for observation work, Sir Evelyn Wood recommended that the Balloon Equipment Store, which had been transferred to Chatham, should be moved to Aldershot. A Balloon Section of the Royal Engineers, with strength of three officers, three Sergeants, and 28 other ranks, was authorised in the 1890 Army Estimates and came under the command of Lieutenant HB Jones. Otto Lilienthal (1848-1896) built and flew his first cambered wing glider of his own design from a hill at Gross Licherfeide, near Berlin, Germany. Following his wind-tunnel experiments with curved aerofoils, Hiram Maxim (1840-1916), constructed a powered aeroplane mounted on wheels to run along a railway track. The 2,000ft long upper and lower track was erected in Baldwyn’s Park, Bexley. The upper track was provided to prevent the aircraft from gaining too much height. Several runs were carried out but on the final one, the machine hit the upper rail too violently and the aircraft was wrecked. Due to the efforts of Captain B F S Baden-Powell (1860-1937), Scots Guards, introduced the first man-lifting kite balloons were added to the equipment of the Balloon Section - this represented the first activities of the Army with heavier than air aircraft. A large kite balloon shed was erected at Aldershot. Major von Parseval (1861-1942) and Captain Sigsfeld produced in Germany, the first ‘sausage’-shaped kite balloon. This was the Drachen [‘Dragon’], of 28,300cu ft and this type was still in use by the German Army when war broke out in 1914. Salomon August Andree, a Swedish Engineer, carried out the first attempt to fly the North Pole which ended in failure with the loss of Andree and his crew. The Aero-Club de France founded. On 30 September 1899, having completed his triplane, he had intended to demonstrate it to a group of onlookers and potential sponsors in a field near Stanford Hall. However, days before, the engine crankshaft had broken and, so as not to disappoint his guests, he decided to fly the Hawk instead. The weather was stormy and rainy, but by 4 pm Pilcher decided the weather was good enough to fly. Whilst flying, the tail snapped and Pilcher plunged 10 metres (30 ft) to the ground: he died two days later from his injuries with his triplane having never been publicly flown. The Boer War - a detachment of the Balloon Section was sent out with the Expeditionary Force. Balloons were engaged on reconnaissance and gun-spotting duties at Paardeburg, Ladysmith, Fourteen Streams, Pretoria and Magarsfontein. The campaign showed up the deficiencies of the organisation - the gas cylinders were difficult to transport and the use of flags as a means of signalling between the air and ground were not understood by the artillery. Count von Zeppelin (1838-1917) launched his first rigid airship at Lake Constance, Germany. Called the LZ 1, it was 418ft long and built of an aluminium framework containing 17 gas compartments. The whole structure was clad with waterproof cotton cloth. 1901 - The Aero Club of the United Kingdom founded. The Wright brothers, Orville [1871-1948] and Wilbur [1867-1912], made their historic aeroplane flight of a few seconds duration on the Kill Devil Hills near Kitty Hawk, North Carolina, USA. The Royal Engineers Balloon Factory and Balloon Units under the command of Colonel JE Capper (1864-1955) moved from Aldershot to the northern edge of Farnborough Common, where the 1895 airship shed was re-erected. There were now six balloon companies, resulting from the South African War, when the number of balloon sections was increased from one to six. The first British naval experiments with a captive hydrogen balloon were conducted during 1905, off Gibraltar with the balloon tethered to a destroyer. Lieut. Kerrison Kiddle, RN at a height of 800ft located eleven submarine mines (out of a possible 12) in 0.75 hour. By 1918 one in four RN ships at sea had a kite balloon flying. Lieutenant John William Dunne, Wiltshire Regiment was the first officer in the British Army to design and build a soaring glider - when he was invalided home during the Boer War. Orville and Wilbur remained airborne for 38 minutes and covered 24 miles. Rolls Royce Ltd was registered as a public company to produce motor cars and engines. The Brazilian, Alerto Santos-Dumont (1873-1932) won the Archdeacon prize for the first powered flight in Europe. His aeroplane called ‘14-bis’, was built by Voisins and flew a distance of 160ft. Three weeks later he increased this to 722ft and won the prize of the Aero-Club de France, for the first public flight of 25 metres. Lord Northcliffe (Alfred Charles William Harsworth 1865-1922) deplored Britain’s backwardness in aeronautics and, inspired by the feat of Santos-Dumont, made an offer in the Daily Mail of £10,000. The money was to be paid to the first member of an Aero Club who in one day, could fly from a point within five miles of their London office to a given point within five miles of the Manchester office of the Daily Mail, or vice-versa. 1907 - At the newly opened Brooklands Motor Racing Track, Alliott Verdon-Roe [1877-1958], began to erect his first full-sized aircraft. Britain’s first Government non-rigid military airship, ‘Nulli Secundus’, [50hp Antoinette] was completed and flown over London by Samuel Franklin Cody [1861-1912] and Colonel Caper. This airship was 112ft long and contained 85,000cu ft of gas. AV Roe started to construct a small triplane of his own design on Lea Marshes. Major Caper and the Balloon Section of the RE built the first British Army Aeroplane which was developed through 1907, 1908 and 1909. The first official recorded flight being in October 1908. in February 1909, military funding ceased from which time Cody continued his development using his own funds. One of his more notable flights was 400yds long at a height of 12ft with a speed of 12 mph against the wind. Pemberton Billing built an aerodrome of 3,000 acres at Fambridge, Essex. With two large aircraft hangars and a number of bungalows were provided for resident pilots. Also available was a hotel, general stores, post office and clubhouse. Henry Farman (1874-1958) succeeded in flying a circular course of one kilometre in a Voisin biplane to win the Deutsch-Archdeacon prize of 50,000 francs. The proposals for the first British rigid airship were put forward by the Director of Naval Ordnance, Admiral Bacon. A contract was eventually awarded to Vickers Sons and Maxim Ltd. at Barrow-in-Furness for its design and construction. This was known as the Naval Airship No.1 (R1) and unofficially known as the ‘Mayfly’. This airship never flew however, as it broke its back when removed from its shed on 22 September 1911. The Daily Mail offered £500 for the first Channel flight by aeroplane, and in the New Year, doubled the sum. Samuel Franklin Cody made the first sustained powered flight by an aeroplane in the British Isles from Farnborough Common reaching a height of 35 feet before crashing. The aircraft was known as 'British Army Aeroplane Number 1' or 'Cody Flyer' after military funding for the aeroplane had ceased. During 1909 Geoffrey de Havilland (1862-1965) and Frank Herle constructed their first biplane and engine, but only managed a few hops before crashing. A second machine built at Newbury in 1910, based on a box-kite type aircraft was successful to become one of Britain’s first flyable aircraft. The Air League of the British Empire formed, to further the course of aviation. Cody flew the first British military aircraft ‘British Army Aeroplane No.1’ at Farnborough. The Aero Club’s aerodrome at Shellbeach, Isle of Sheppey was being prepared and opened in February 1909. A house, Mussel Manor was turned into a clubhouse. Short Brothers were already established there while constructing under licence Wright type aircraft for various members of the club. The first British Aero Show at Olympia took place with a display of seven pusher type biplanes, two monoplanes and two orthopters. The first airfield in the New Forest opened at East Boldre/Beaulieu by William McArdle and J Armstrong Drexel. During May, the second British non-rigid airship ‘Baby’ built. Vickers Sons and Maxim Ltd. at Barrow-in-Furness designed the first all-British rigid-airship, known as Naval Airship No.1 [R1] and unofficially named the ‘Mayfly’. This airship never flew as its back broke when removed from its shed on 22 September 1911. Caper and the Balloon Section of the RE built the first British Army Aeroplane which was flown in February 1909 by Cody at Laffan’s Plain. One notable flight was 400yds long at a height of 12ft and a speed of 12 mph against the wind. Cody set a new British duration record when he flew in a straight line from Laffan’s Plain to Danger - a distance of one mile. Brothers - Louis and Laurent Seguin develop their ‘Gnome’ aero-engine. Brothers - Louis and Laurent Seguin develop their ‘Gnome’ aero-engine. The Gnome of unique design has its seven cylinders arranged radially and fitted to a crankshaft that remained fixed to the aircraft. The cylinders and propeller rotated together. Frederick Handley Page [1885-1962] founded at Barking, Essex, Handley Page Ltd. The company moved to new premises at Cricklewood in 1912. Hubert Latham (1883-1912) in an Antoinette attempted the first Channel crossing by air. 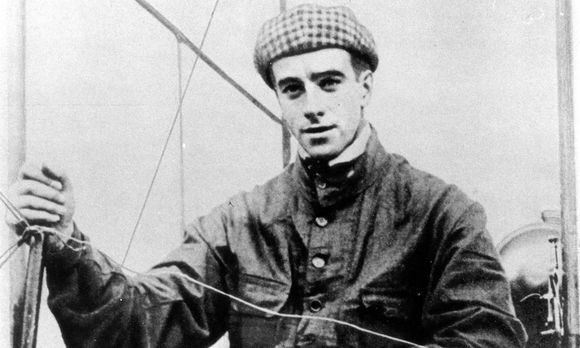 Hubert Latham (1883-1912) in an Antoinette attempted the first Channel crossing by air. Flying from France, his engine failed and he was forced to land in the sea. The first flight took place of the first all-British aircraft. The first flight took place of the first all-British aircraft. AV Roe constructed a triplane called ‘Avroplane’ in an arch of a railway bridge over the river Lea at Walthamstow. His flight covered a distance of 899ft. Louis Bleriot (1872-1936) successfully flew from Croix-Briquet-Cheville to Northfall Meadow, Dover, a distance of 31 miles in 40 minutes at an average speed of 45 mph to win the Daily Mail prize of £1,000. The first great International Aviation Week opened at Rheims. The first great International Aviation Week opened at Rheims. Out of 38 aircraft present only two were owned by British representatives. No British-built aircraft took part but one Voisin and a Bleriot were equipped with British-built engines. A new Superintendent of the balloon factory was appointed - Mervyn O’Gorman had been selected by Mr. Haldane, the Secretary of State for War, for the task of creating a military aircraft factory for both airships and aeroplanes. Raymonde de Laroche flew solo and became the first women pilot. JTC Moore-Brabazon won the Daily Mail £1,000 prize for the first flight of an all-British designed and constructed aeroplane with a British pilot. Claude Grahame-White (1879-1959) opened the first British-owned flying school at Pau, France. Richard Fairey (1887-1957) won a model aeroplane contest in 1910. Richard Fairey (1887-1957) won a model aeroplane contest in 1910. His design infringed on the patents of John Dunne and as a result, he was made shop manager for the Blair-Atholl syndicate which was building Dunne’s stable aeroplanes. By 1915, Fairey had formed his own company (Fairey Aviation) building Sopwith aircraft under licence. From 1910, Robert Blackburn (1885-1955) started to conduct trials with his first monoplane at the Marske Sands on the Yorkshire coast. ET Willows in his ET Willows No.3 non-rigid airship became the first airship pilot to cross the English Channel. The Bristol Company had established in 1910 an aerodrome at Larkhill to develop their Farman type biplanes under close supervision of the Military authorities. By the end of September the company was collaborating with the War Office in the Army manoeuvres. During these experiments, Lieut. Robert Loraine transmitted messages from his aircraft to a portable wireless station at Larkhill. One way communication was maintained up to a distance of 0.25 mile. At the close of the manoeuvres on 30 September, Lieut. Loraine managed to increase the range to over one mile. HM King Edward VII honoured the Aero Club by granting permission to use the prefix ‘Royal’ and henceforth the club has been known as the Royal Aero Club of the United Kingdom. 881 British subjects pass their flying certificate by the start of WWI. Between March 1910 and the outbreak of the First World War, a total of 881 British subjects had passed their flying certificate either in Britain or abroad. Of these, 305 were serving officers, 47 were NCOs or men in the Army, or the RFC, Military Wing. 101 were RNAS officers and 39 were Petty Officers or ratings. The fighting services therefore up to 4 August 1914, had a total of 492 - more than half of the total number of British Pilots. Altogether 389 civilians had also qualified. Forty pilots (half were civilians) had been killed in flying accidents before 4 August 1914. Moore-Brabazon, acknowledged as the first British pilot to have made a controlled flight, received Royal Aero Club pilot’s certificate No.1. M. Louis Paulhan (1883-1963) won the Daily Mail £10,000 prize flying from London to Manchester in a Henry Farman biplane with a 50hp Gnome rotary engine. CS Rolls completed a return flight to France in a Short-built Wright biplane to become the first English pilot to cross the Channel, the first person to cross from England to France and the first to make the double crossing. 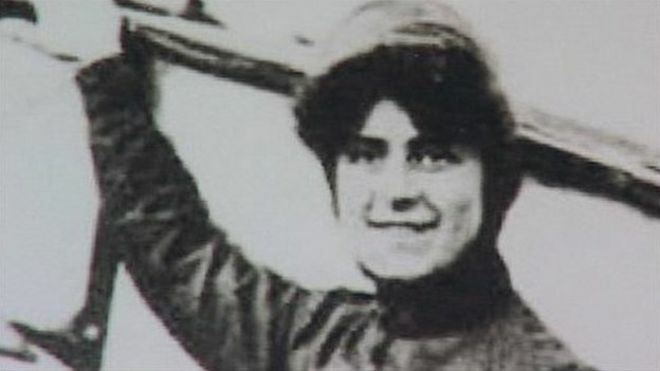 Edith Maud Cook (also known as Viola Spencer) - the first British women to fly solo  was killed whilst making a parachute jump from a balloon at Coventry. Rolls killed while taking part in the Bournemouth Aviation Week - the first British pilot to be killed flying a powered aircraft. Grahame-White without consulting the Admiralty, took his Farman biplane down to Penzance and flew high over 200 warships (the combined Home, Atlantic and Mediterranean Fleets) gathered in Mount’s Bay for an informal review by King George V. Flying at 1,200ft, he singled out Admiral May’s flagship, HMS Dreadnought and the Admiralty yacht Enchantress for a display of banks, figures-of-eight and dives to mast height. The truth soon dawned on the Admiral and his staff that the whole fleet, with its combined tonnage of 700,000-tons and crews of 50,000 men, was powerless to destroy the aircraft. 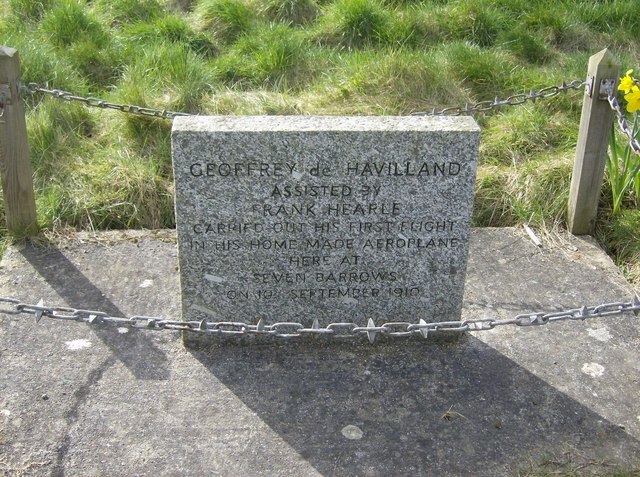 Geoffrey de Havilland made his first successful flight at Seven Barrows(west of Stockbridge). A monument marks the site. Anything © Copyright Graham Horn and licensed for reuse under this Creative Commons Licence. In the autumn of 1910, the War Office had been impressed with the use of the aeroplane in the French Army and its military possibilities. The War Office therefore announced in the national press that it had been decided ‘to enlarge the scope of the work hitherto carried out by the Balloon Section at Farnborough by affording facilities for aeroplaning as well as by developing the training in the employment of dirigibles more fully than has hitherto been the case. The object to be kept in view will be to create a body of expert airmen, etc’. M. Louis Bleriot opened Hendon Aerodrome to the public. The Bleriot Company erected eight hangars; three were leased to the Aeronautical Syndicate Ltd, who manufactured a tailless pusher type monoplane known as the ‘Valkyrie’. The non-rigid dirigible, ‘Clement Bayard’ flew from France to Wormwood Scrubs for evaluation by the Government Balloon Factory at Farnborough. Eugene Burton Ely became the first person to take off from the deck of a ship when he flew his Curtiss Pusher Biplane from the deck of the USS Birmingham whilst at anchor in Hampton Roads, Virginia. He also, arguably, created the first aircraft carrier in the process. Eugene Burton Ely flies from USS Birmingham during the afternoon of 14 November 1910. USS Roe is visible in the background. The Bristol Company at their Filton works had turned out 40 aircraft by the close of January 1911 with output established at two aircraft per week. Eight biplanes were under construction for the Russian Government, to complete the first order ever placed with a British aircraft firm by a foreign power. Vickers Ltd, acquired part of Franks Farm, Joyce Green in 1911 for the construction of an aerodrome from which to test their aircraft manufactured at their Erith works. The War Office bought the de Havilland No.2 biplane and renamed it the FE1 (Farman Experimental 1). Captain WG Windham carried out the world’s first Air Mail service at Allahabad (India). On his return to England in September, he set up an experimental Air Mail service from Hendon to Windsor using special envelopes and postcards. An Army Order issued by the War Office outlined details of the new Air Battalion which was to supersede the existing Balloon School at Farnborough. The Air Battalion was to comprise of a headquarters and two companies: No.1 (Airship) Company at Farnborough, and No.2 (Aeroplane) Company at Larkhill. The personnel comprised a Major commanding, 13 other officers, 23 NCO’s, 153 men of the Royal Engineers and two buglers. Equipment included four riding horses, 32 draught horses, five experimental aeroplanes, including Wright, Farman, Paulhan, and de Havilland biplanes, and a Bleriot monoplane. The first naval officers had commenced flying instruction under GB Cockburn at Eastchurch. The flying school proprietor - FK McClean had joined the Government expedition to the Fiji Islands to observe the eclipse of the sun. At the beginning of 1911 he placed his aircraft at the disposal of the Admiralty for the training of naval officers as pilots. Mr Cockburn volunteered to act as instructor and Messrs Short Brothers arranged for technical instruction to be carried out at their factory at Leysdown. This was the beginning of the Naval School of Flying at Eastchurch and laid the foundation for the Royal Naval Air Service. The Air Battalion came into existence under the command of Major Alexander Bannerman, Royal Engineers. The War Office also announced that Army officers were free to have themselves trained as pilots at civilian schools at their own expense. After gaining an RAeC certificate, would be granted £75 and posted to the Air Battalion. A demonstration of the military possibilities of aircraft to 300 invited members of Parliament, including Mr. Asquith, (Prime Minister), Mr. Balfour, Mr. Lloyd George, Mr Winston Churchill and Lord Northcliffe. Grahame-White demonstrated bomb-dropping from a Henry Farman with 100lb bags of sand onto an outline of a battleship whitewashed on the grass. By arrangement with the War Office, a number of troops were positioned under cover between Hendon and St. Albans. M Hubert and CC Paterson flew two Army officers over this area at 3,000ft, and the latter returned having correctly plotted the positions of the infantry and artillery on the maps provided. Lieutenant EL Gerrard RMLI, accompanied by Lieutenant Wildman Lushington RMA, set up a British and World record for duration and distance flown with a passenger, using a Short biplane (4 hrs. 13 minutes at a distance of 129 miles). The second British women pilot - Mrs Hewlett - received her pilot’s licence at Brooklands. The first airmail plane left Hendon on 9 September at 4.55pm carrying one bag of mail weighing 23 ½ lbs and arrived safely at Windsor just 12½ minutes later. The mail was then taken to the Post Office in Windsor by the cycle Postman, sorted and despatched to London by the 6pm train. Four pilots were engaged to operate the Aerial Post service with Gustav Hamel performing most of the 1911 flights in his Blériot monoplane. He became one of the best-known aviators of the time but died soon after these pioneering airmail flights when he drowned in the Channel in 1914. That flying was very precarious was also proven by the accident of one of the other airmail pioneers. Frenchman Charles Hubert crashed in his Farman biplane attempting to take off from Hendon on 11 September 1911 with eight mail bags and broke both thighs. The sub-committee of the Committee of Imperial Defence, under the chairmanship of Lord Haldane (he had been created a Viscount that year), was instructed by the Prime Minister to consider the future development of aerial navigation for naval and military purposes. Also the measures required to secure an efficient aerial service. Naval School of Flying established at Eastchurch. The Italian Government obtained a licence to build 28 Bristol two-seater monoplanes - this was the first instance of British aeroplanes being manufactured abroad by a foreign power. Also in 1912, the Government placed its first order with AV Roe and Co. Ltd of Manchester for three two-seater biplanes. Captain H.P.T. Lefroy R.E, as observer and Geoffrey de Havilland piloting, the B.E.1 was flown in the first successful wireless-controlled artillery shoot over Salisbury Plain during January 1912. In May of the same year, Lefroy fitted a generator, driven by bicycle chain from the engine, to the aircraft. Experiments continued using descendants of the B.E. 1 through to 1913 and 1914. The first take off from a Royal Navy Warship. Lieutenant Charles Rumney Samson, RN flew a Short-Sommer S38 Bi-Plane from staging erected above the forepart of the cruiser HMS Africa, at anchor at Sheerness - the first successful take-off from a Royal Navy vessel. HMS Africa has the distinction of being the first aircraft carrier in the Royal Navy. SF Cody set up a new British record. SF Cody set up a new British record by flying around Laffan’s Plain for seven miles at an altitude of 100 feet, with four passengers. Germany’s first commercial airship ‘Viktoria Luise’ carried 23 passengers a distance of 200 miles in 7.5 hours. The recommendations by the Committee of Imperial Defence resulted in a Royal Warrant to constitute the Royal Flying Corps. The Government published a White Paper giving details of its formation; a sum of £320,000 had been allotted to the War Office for this purpose and £90,000 was to be spent on a new aerodrome at Upavon on Salisbury Plain. A total of 36 new aircraft [half of them British] had been ordered to supplement the sixteen already owned by the Army. No.3 Squadron, RFC Military Wing, formed at Larkhill from No.2 Company of the Air Battalion, Royal Engineers. No. 2 Squadron was formed from the nucleus of pilots at Farnborough. No.1 Company, which had dealt with airships, became No.1 Squadron, RFC, but was then transferred over to the Admiralty as part of the Naval Wing. The RFC Military Wing was now therefore without a No.1 Squadron until it was formed in 1915. The Central Flying School officially opened at Upavon under Captain G Paine, RN. Mr Perry took over the post of pilot-instructor to the Sopwith Flying School at Brooklands in lieu of Mr Raynham. Amongst his pupils was Major Hugh Montague Trenchard, who was destined to become the first Marshal of the Royal Air Force, and who had taken his RAeC Certificate on the school’s old Henry Farman biplane. Throughout August, the Military Trials - competitions for military aeroplanes took place at Larkhill - this was the most searching test to which flying machines had ever been subjected to in Great Britain. Altogether 31 different types were entered in what was the most searching test for both British and foreign aircraft constructors to which flying machines had ever been subjected to in Great Britain. One test involved the assembly of aircraft and their subsequent first flight. An aircraft was presented to the judges still in its packing case. Against the clock, the crew removed the aircraft components, assembled them together for the pilot who then had to fly the machine around the aerodrome. At the end of the flying test, the aircraft had then to be dismantled again, folded up, driven with a vehicle a few miles, then re-erected and flown once more. Out of 19 aircraft taking part, only eight survived the test. Major Hugh Trenchard wins his flying certificate at Larkhill and is posted to the CFS as an instructor. The Central Flying School of the RFC at Upavon, was formally opened, when 17 pupils commenced the first course. The instructional aircraft fleet consisted of seven biplanes. No.4 Squadron, RFC Military Wing, was formed during September 1912 at Farnborough. As a result of the break-up in the air of two monoplanes of different types whilst flying in normal weather conditions, the Secretary of State for War, Colonel Seely banned the flying of all monoplanes by pilots of the Military Wing of the RFC. The ban was finally lifted in February 1913. Harry George Hawker (1889-1921) was awarded aviator’s certificate No.297, having passed his test at Brooklands on Farman biplane. The first appearance of the RFC as a separate unit in the Army List was in October 1912. Hawker entered and won the British Empire Michelin Trophy No. 1. Hawker entered and won the British Empire Michelin Trophy No. 1. The race called for an all-British aeroplane to remain in the air for the longest time, without touching the ground. A minimum of five hours in the air was required. Hawker, only having gained his licence on 17 September, flew a Sopwith Wright biplane on 24 October for 8 hours, 23 minutes to win the trophy and a cash prize of £500. This was a new all-British record for flight duration. In 1913, the Admiralty opened a naval air station at Great Yarmouth. In 1913, the Admiralty opened a naval air station at Great Yarmouth. A section of the Naval Wing, RFC had already quartered at Calshot Castle. Two famous boat builders of Cowes IOW, J Samuel White & Company, and Messrs. Saunders, entered into the design and construction of seaplanes and flying boats. Machines built by these two companies were exhibited at the Olympia Aero Show. Out of 25 aircraft on show, five seaplanes and one flying boat were on display. The Admiralty, under Winston Churchill made several purchases at the Aero Show including a Short seaplane, one Avro and two Bristol tractor biplanes, a Vickers pusher biplane, Sopwith-Saunders flying boat and two Sopwith three-seater tractor biplanes. The first five aircraft of No. 2 Squadron of the Military Wing, RFC flew from Farnborough to make their way to the new RFC aerodrome at Montrose. The flight of 450 miles took nine days. The Royal Aero Club granted Major Hugh Trenchard (1873-1956) his brevet on 13 March 1913 (pilot’s certificate No.270). The Army Estimates for 1913 and the low figure of £501,000 to be used for the maintenance and development of the CFS, the Military Wing, RFC and the Royal Aircraft Factory - led to a campaign by the Daily Mail and other members of the Press to attack the Government. This led to many awkward questions in the House of Commons about the current state of the RFC and the numbers of aircraft on strength. Calshot Naval Air Station opened on Calshot Spit under command of Lt. DA Spenser Grey RN. M. Jacques Schneider presented a trophy for competition amongst pilots of seaplanes. The first contest which took place on 15 April, was won for France by M. Prevost flying a Deperdussin (160hp Gnome). No. 3 Squadron of the Military Wing, RFC, flew from Larkhill to Farnborough as a unit. A very important development was the entry into aviation, of Armstrong-Whitworth & Co. Ltd, when they commenced the manufacture of the 100 hp ABC aero-engine. Cody’s new biplane collapsed in the air above Laffan’s Plain - killing Cody. The control of military aviation transferred from the Master-General of Ordnance to a new ‘Department of Military Aeronautics’ in command was Director-General, General D Henderson. Four RFC pilots, Captains, Dawes (M. Farman), Captain Becke and Lieutenants. Dawes and Waldron, all flying BE 2’s flew to Rathbone near Limerick. This was the first occasion upon which a unit of the RFC had flown overseas. Pemberton Billing (1881-1948) bought premises in Southampton to set up a seaplane factory. He adopted the word ‘Supermarine’ as his telegraphic address. Beardmore Builds acquires Daimler rights. Beardmore and Co. Ltd acquired the rights to build the Austro-Daimler aero engine and on the strength of this received an order from the Government for 24 units. As a result of accidents involving Deperdussin, Cody biplanes, and Bristol monoplanes in 1912/1913, the Army Orders, announced the formation of the Aeronautical Inspection Department (AID) of the Military Wing, RFC under the command of Major JDB Fulton. New aeroplanes and engines were delivered by road to Farnborough for erection and flight test prior to acceptance by the AID. Harry Busteed makes the first test flight of the Bristol Scout biplane at Larkhill. All airship equipment and balloons were passed over to the Naval Wing who temporarily used Farnborough until Kingsnorth opened in April. Preliminary training of officers and men took place at Roehampton and Wormwood Scrubs. The handling and navigation of airships was undertaken at Kingsnorth. The second contest for the Schneider Trophy took place and was won for Britain by Howard Pixton flying a Sopwith Tabloid (100hp Gnome) fitted with floats. No.2 Squadron were ordered to leave its station at Montrose in order to take part in a general mobilisation of the Military Wing RFC, on Salisbury Plain. Ten aircraft, 34 transport vehicles with tools and spares and the rest of the personnel of the squadron left Montrose. The idea was that the squadron would move down as a unit with the aircraft flying short intervals to allow the transport to catch up. The journey to Netheravon, of nearly 500 miles lasted 20 days, cost the lives of one officer and one airmen and the loss of three aircraft. The RFC was split in two during June 1914, when the Admiralty announced the formation of the Royal Naval Air Service (RNAS), consisting of the Air Department (Admiralty), the Central Air Office, the Royal Naval Flying School, and the Royal Naval Air Stations. At the Concentration Camp at Netheravon, there were 700 officers and men of the Headquarters Flight and Nos. 2,3,4 and 5 Squadrons of the Military Wing, RFC. They were all taking part in various exercises associated with the class of work that aeroplanes would be engaged in during actual warfare the - reconnaissance of the enemy. The Pemberton-Billing aircraft company is officially registered, using the telegraphic name Supermarine. Archduke Franz Ferdinand, heir to the throne of the Austro-Hungarian Empire is assassinated in Sarajevo, Bosnia. Royal Navy pilot Arthur Longmore launches a 14-inch torpedo from a Short seaplane. Major Hugh Trenchard is appointed commandant of the RFC Military Wing. Declaration of War with Germany. On the outbreak of war, a detachment of the RNAS was sent to Belgium and airship and seaplane patrols were instituted between the East Coast of England and the Belgian coast. All available pilots and aircraft of the RFC proceeded to France with the British Expeditionary Force. The first ‘Defence of the Realm Act [DORA] passed by Parliament. No.5 Squadron, RFC, forced down the first German aircraft of the First World War. The second Bill of the Defence of the Realm Act, laid before Parliament to extend these powers to include control over armament factories and their workers. At the request of the Secretary of War (Lord Kitchener), the First Lord of the Admiralty was invited to become responsible for home defence against enemy aircraft. During the defence of Antwerp, the RNAS conducted their first bombing raid - the target was Dusseldorf. The second raid on Dusseldorf destroyed an airship shed. The first naval balloon detachment (with three spherical balloons, each of 13,000 cubic feet) left Farnborough for Dunkirk, France to observe for naval guns. The first successful wartime aerial photograph was taken of the village of Neuve Chapelle. The Military Wing photographic section at this time consisted of two officers and three airmen. The equipment comprised of just two cameras and a portable box for developing chemicals. A detachment of the RNAS was sent to Belgium and airship and seaplane patrols were instituted between the east-coast of England and the Belgian coast. The RFC re-organised into Wings. RNAS aircraft drop the Union flag insignia in favour of a roundel (blue and white rings with a red centre) as used by the French. The first air-raid took place on Britain when a single aircraft dropped bombs close to the Admiralty Pier at Dover. In a Christmas prank, Captain LA Strange of 5 Squadron, RFC flies to the German airfield at Lille, in NE France, and 'bombs' it with footballs. All military air stations except those west of Farnborough were instructed during January, to keep two aircraft ready for action on receipt of a warning of an impending night air-raid. Wing Commander EM Maitland, RNAS inspected a Belgian kite balloon which was flying at a time when the British balloons were grounded due to the poor January weather. He came to the conclusion that captive spherical balloons were handicapped by the weather and therefore recommended the formation of kite balloon sections. A scheme of co-operative aircraft construction was established in Scotland with G & J Weir as the central firm. This system utilised a number of small sub-contractors for the manufacture of aeroplane parts in conjunction with final assembly of the component parts in their own works. By the summer of 1915, similar centres to that operating in Scotland had been set up in Coventry, Manchester and London. Work started on constructing an aerodrome at Northolt. Trenchard promoted to Brevet Lieutenant-Colonel. First Zeppelin raid on England. On the night of 19/20 Jan 1915, German Navy Zeppelins L3, L4 and L6 were sent to carry out air raids on Britain. L6's attack on the Thames Estuary was cancelled when she developed engine trouble. Intending to attack the Humber area, L3 reached Great Yarmouth at 2020 and started bombing. L4 was lost, and ended up dropping her bombs near Kings Lynn and some Norfolk villages. For the defence of London, Night Landing Grounds were prepared at Blackheath, Enfield, Eynsford, Romford and Wimbledon. All were located close to military units for providing personnel to operate aerodrome lights. When night flying was in progress, Hounslow and Northolt would be illuminated. 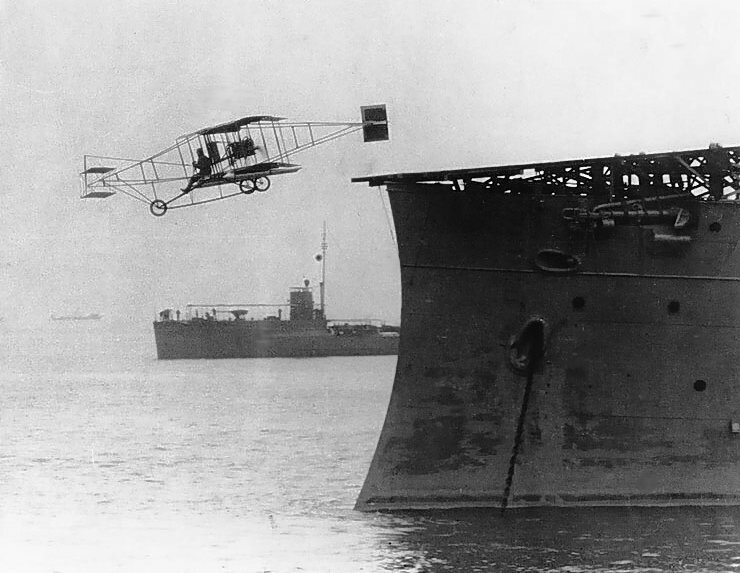 HMS Ark Royal, a former merchant ship converted into an aircraft carrier in 1914, launches RNAS seaplanes in the Dardanlles to reconnoitre Turkish forces. As demand and output of new aircraft and engines increased, contractors from March 1915 had to deliver new machines to specified aerodromes. These were to be located close to their own works instead of the previous method of supplying new aircraft to Farnborough for acceptance. Under the new system, aeroplanes were erected by the firm’s own staff and handed over for flight test by the pilots of the Aeronautical Inspection Department. This eventually led to the establishment of a number of Aeroplane Acceptance Parks. 2nd Lieutenant WB Rhodes-Moorhouse of 2 Squadron, RFC, while stationed at Merville, France, carried out a bombing raid on Courtrai railway station. During this successful raid, Rhodes-Moorhouse was fatally wounded and was awarded the Victoria Cross - the first to be given to a pilot. From May 1915, the aerodromes at Brooklands, Dover, Hounslow, Joyce Green, Northolt, Shoreham and Suttons Farm each had one aircraft at readiness for night flying for home defence. The first RNAS kite balloon sections were despatched in May 1915 to France. Wing Commander Maitland, RNAS, had during January 1915 inspected a Belgian kite balloon which had been flying at a time when British balloons were grounded due to the poor weather. He therefore came to the conclusion that captive spherical balloons were handicapped by the weather and recommended the formation of kite balloon sections. The prototype Airco (de Havilland) DH.2 single-seat fighter is tested. This pusher biplane has a forward-firing Lewis gun. The Ministry of Munitions Act laid before Parliament. Flight Sub-Lieutenant Reginald Alexander John Warneford, RNAS, while flying a Morane monoplane over the German airship station at Gontrode, Ghent, successfully bombed a German airship. For this achievement Robinson received the Victoria Cross and the Cross of the Legion of Honour. This was the first time an enemy airship was destroyed in the air by a British pilot. The Armstrong Whitworth SS (Submarine Scout) airship, fitted with an extra fuel tank to improve its range, is tested successfully at Kingsnorth. After a non-stop day and night production for 12 months to meet war demands, the RAF closes for three days' rest. Colonel Hugh Trenchard takes over command of the RFC from Lt-Gen Sir David Henderson. Brevet Lieutenant-Colonel Trenchard appointed as General Officer Commanding the Royal Flying Corps. Major Lanoe Hawker is awarded the Victoria Cross for his bravery on 25 July, when he shot down three German Albatros biplanes. The assembly and testing began at RNAS Kingsnorth of the first Coastal Class (CC) non-rigid airships. This was essentially an Astra-Torres envelope with a car made from two Avro fuselages joined together with their tails removed They could cruise at a speed of 45 mph and had an endurance of 11 hours. Lord Kitchener intervened and ordered General Henderson to help the Admiralty deal with Zeppelin raids. A plan was drawn up by the Admiralty and War Office during October 1915 for an air defence scheme which formed the embryo of what became known as LADA (London Air Defence Area). The idea was that, an observer reporting screen was to be set up from the coast to within a few miles of London, behind these were to be three night landing grounds each manned by two pilots of the RFC, and lastly there was a screen of mobile guns and searchlights on the outskirts of north-east London. . Flight Lieutenant HF Towler proves that a landplane can operate from an aircraft carrier when he took off from HMS Vindex in a Bristol Scout. Night Landing Grounds were established for the eastern counties, Midlands and north England. BE2c aircraft were allotted to training squadrons at Doncaster, Dover, Norwich and Thetford. Six aircraft were sent to reinforce No.5 Reserve Squadron in the Defence of Birmingham and Coventry. The RFC became responsible for the defence of Newcastle with three BE2c’s on constant readiness at Cramlington. By March 1916, the defence of Leeds at Bramham Moor and of Hull, from Beverley - had also been established. December 1915 to February 1916 - The War Office took over from the Admiralty the function of home defence against enemy aircraft. By February, the War Office had established a Home Defence Scheme with aircraft, anti-aircraft guns and searchlights. Each had six mechanics and a RE party operating a searchlight. Pilots slept in shifts and communication was provided from the War Office by telephone. Lt-Commanders Stedman and Babington pilot the prototype HP O/100 bomber on its first flight. The first Coastal Class airship station was commissioned at Pembroke with personnel from the airship station at Marquise. The first operational flight took place on 9 June. Night Landing Grounds were also established for the eastern counties, Midlands and north England. BE2c aircraft were allotted to training squadrons at Doncaster, Dover, Norwich and Thetford. Six aircraft were sent to reinforce 5 Reserve Squadron in the defence of Birmingham and Coventry. The RFC also became responsible for the defence of Newcastle and three BE2cs on constant readiness at Cramlington. The War Office took over from the Admiralty the function of home defence against enemy aircraft. On 30 January 1916 RFC Brigade formations came into effect and by February, the War Office had now established an Home Defence Scheme with aircraft, anti-aircraft guns and searchlights. Under Sir David Henderson, two BE2cs manned by specially trained pilots in night flying were to be maintained on a ring of ten aerodromes encircling London. James McCudden is awarded the Croix de Guerre (War Cross). Home Defence detachments located at various training squadrons were grouped together in a single command under Major TCR Higgins, officer commanding No. 19 Reserve Squadron at Hounslow. Also at this time, two aircraft were placed on constant readiness at Brooklands and Farnborough for the local defence of the Royal Aircraft Factory and the gunpowder factory at Chilworth. RNAS airship station Howden opens. By March 1916, Bramham Moor had opened for the defence of Leeds and of Hull from Beverley aerodrome. The first airship shed at Cranwell was completed. All free balloons were transferred here from Wormwood Scrubs. Cranwell eventually took over the training of airship officers and men from Kingsnorth. The Sopwith 1 1/2 Strutter general-purpose two-seat aircraft goes into service with 5 Wing, RNAS. The aerodrome at North Weald Bassett opens. The RNAS training aerodromes at Cranwell opens. During experiments over Harwich to extend the range of fighters, Commander Porte takes off in a Porte Baby flying boat with a Bristol Scout mounted on the wing. Flight Sub-Lieutenant Day, in the 'parasite' Scout, lifts off from the flying boat at 1,000 feet. During trials for the Short 184 seaplane at Kingsnorth, a 500lb bomb is dropped on an armoured roof target from 4,000 feet, using a bomb sight developed by Bourdillon and Tizzard. The first Air Board constituted with Lord Curzon as chairman. At a conference between officials of the Post Office, Home Office and the Railway Executive Committee, Lieut-Colonel Philip Maud, had suggested an early warning system based on the existing telephone organisation should be implemented. His idea was that eight Warning Control Centres, each with a Warning Controller should be located at one of the main centres of the telephone system. The Warning Controller would be responsible for collecting and passing on information and for issuing warnings of an impending air-raid. Each Control Area was to be sub-divided into Warning Districts of 30-35 miles square with a system of observer posts. Information from these posts were to be passed to the local Warning Controller for plotting the progress of the path of Zeppelins. A system of girls Christian names was used for German airships and boys names for British airships. Home Defence Wing became independent of Training Brigade when 6th Brigade formed under Lieutenant-Colonel FV Holt with its headquarters at the Hotel Cecil, London. Albert Ball is awarded the Military Cross. Home Defence stations placed along a line between Dover and Edinburgh to form a Barrage-Line of searchlights from the London Anti-Aircraft Defence Zone to Blyth. Interlaying Barrage-Lines also established in Kent, Essex and Norfolk. Searchlights were placed under the direction of the local Squadron Commander - communication was by telephone. The close defence of Vulnerable Points was now altered to a system of defensive bands across the line of the enemy’s approach. Searchlights under the direction of the squadron commander, were situated along the patrol line of aeroplanes and the searchlight crews were connected with the squadron headquarters by telephone. When news was received that enemy aircraft were approaching, the normal practice was to send up two or three aeroplanes from each flight to patrol the specified areas. Aircraft of 4 and 5 Wings, RNAS, try out new bombing tactics during a raid on Ghent: 11 bombers attack in line astern directed by Very signals from a Sopwith 1 ½ Strutter. The flight station at Goldhanger opens. William Leefe Robinson of 39 Squadron, RFC while flying a BE2c aircraft, successfully shot down the Schutte-Lanz airship SL11- to become the first British pilot to bring down an enemy airship over Britain. For this achievement Robinson received the Victoria Cross. The wooden structural remains were taken to the airship shed at Wormwood Scrubs for detailed examination. The flight station at Stow Maries opens. The Supermarine Aviation Works Ltd is formed; Noel Pemberton-Billing, who originally founded the flying boat company in 1914, sold his interest after being elected to Parliament on 10 March. Germany loses its most successful airship captain, Heinrich Mathy, killed when airship LZ 72 was shot down over Potters Bar. Despite civil air operations are banned, George Holt Thomas registers the airline, Aircraft Transport and Travel Ltd. Delivery of the first Handley-Page 0/100 heavy bombers to the RNAS aerodrome at Coudekerque, near Dunkirk. The Air Board moved its headquarters from Carlton House Terrace to the Hotel Cecil. The hotel was shared with various other Government Departments including the Ministry of Munitions. A kite balloon training centre opened in 1917 at Rollestone Camp, Larkhill. Work started on the construction of an RFC aircraft depot at Henlow which became in May 1918, the Eastern Area Aircraft Depot. The Cabinet approves a War Office plan to increase the number of RFC squadrons from 108 to 200. Decentralisation of home defence to form a Home Defence Group consisting of Northern and Southern Areas, each controlled from the Hotel Cecil. James McCudden awarded the Military Cross. The first night-bombing raid by a British heavy bomber aircraft took place when a single HP 0/100 of the RNAS 3rd Wing flew from Luxeuil and bombed the railway station at Moulin-les-Metz. On the 13 June, the first daylight air-raid on London took place by fourteen twin-engined Gotha aircraft. Horrace Short, 44 eldest of the three brothers who founded the Short aircraft company dies. The Royal Aircraft Factory SE5 single-seat fighter enters service with 56 Squadron. A RNAS flying boat, commanded by Flight Sub-Lt CR Morrish, sinks the German U-36, the first submarine sunk by an aircraft. An Aircraft Production Board had been established in America and the Bolling Mission sailed for Europe to gain information for an American aircraft programme. General Sir Sefton Brancker, Deputy Director General of Military Aeronautics, submitted proposals to centralise the technical training of men, women and boys in a new school to be located at Halton, Bucks. The award is announced of a posthumous Victoria Cross to Albert Ball. The first daylight air-raid on London took place by 14 twin-engined Gotha aircraft. The first contingent of American aviation engineers (93 civilians) sail to England to study British and French aircraft manufacture. To meet the entry of the United States into the war, German Army Air Service presents the War Ministry with its Amerika-programme, an agenda which includes creating 40 new fighter squadrons and boosting aircraft output from 1,000 to 2,000 a month by 1 March 1918. RFC squadrons receive the new Sopwith Camel single-seat fighter into service. Brigadier-General AB Ashmore took command of the London Defence Area. Contract No. A522689/1/17 awarded to Vickers Ltd. for three prototype experimental heavy bombers - the Vickers FB 27, later to be known as the Vimy. Sanction was obtained to fund the setting up at Government expense, of three new National Aircraft Factories, to be operated under the control of the Department of Aircraft Production. After the success in August 1917 of the balloon barrage defence apron erected for the protection of the important steelworks at Neuve-Maisons, Nancy, it was decided to provide similar defences for Paris and London. A scheme was therefore put forward by Major General Ashmore, GOC London Air Defence Area. His idea was that a balloon barrage consisting of several balloons of the Caquot type connected together by a cable with weighted wire streamers could form an ‘apron’. Also, small balloons, each on a single light cable, could be suspended over the rivers Medway and Thames. The scheme was approved in principal and trials took place at Richmond Park, but unfortunately the five Caquot balloons, joined at the top by a cross cable, broke away from their moorings killing two operators. Further trials with just three balloons proved very successful and on 22 September, an order was issued to pilots that balloon aprons were to be established along the following route: On a line east of Lewisham, east of Plumstead, one mile east of Barking, the east edge of Ilford, the east edge of Wanstead and the north edge of Tottenham. No aircraft were to fly across the lines during operations at a height less than 10,000ft. Each one contained three Caquot balloons joined together by a horizontal wire and suspended from this were 1,000ft long wires set apart by 25yds. The first apron started operating on 6 October 1917 and a request was made for more; by the end of the First World War, ten aprons were in operation. The aprons had considerable moral effect on the German pilots and in March 1918, General von Hoeppner made a report that ‘the aprons had increased enormously, and that they added greatly to the difficulties of the attack. If they were increased and improved much more, they would make a raid on London almost impossible’ (Ashmore). The Germans started bombing Dunkirk with a new type of four-engined armoured aircraft. The importance of heavy bombing was soon realised by the British Government and in November, Sir Douglas Haig recommended the formation of 66 squadrons of long-distance bomber aircraft for operations against Germany. Sir William Weir had already ordered in July, 700 DH9 aircraft for day bombing and in September, 400 Handley Page bombers for night operations. Due to technical difficulties these aircraft were not on the production lines until the spring of 1918. Around October, Short Brothers departed from their Eastchurch works to centralise production of seaplanes at Rochester where they had an existing factory close to the River Medway. In France, 41 Wing RFC is formed under Lt-Colonel C Newall to bomb German industrial targets. Two flights of de Havilland bombers took off from Ochey for the first RFC long-range attack on a German target - the Burbach iron foundry, near Saarbrucken. The Admiralty orders light cruisers and battle cruisers to carry fighter aircraft. The prototype Vickers Vimy bomber makes its first flight. An Air Council was set up by Order in Council with Lord Rothermere as Secretary of State for Air in January 1918 - the Air Board was now reconstituted as the Air Ministry. Offices were still located in the Hotel Cecil until the Air Ministry was transferred to its new permanent office at Adastral House in the Kingsway, London. The first Chief of the Air Staff, Air Chief Marshall Hugh Trenchard, devised a plan, for combining American bomber crews with British crews to create an inter-Allied bombing force using the Handley Page 0/400 and the larger Handley Page V/1500. The 1918 New Year Honours List announced that Trenchard had been awarded a Knighthood for services in the field. The Air Ministry is established with Lord Rothermere as Secretary of State for Air and Major-General Sir Hugh Trenchard is Chief of Air Staff. Trenchard resigns on 13 April. The first operational squadrons of the American Expeditionary Force are formed. A separate corps for women - the Women’s Royal Air Force, formed with Lady Gertrude Crawford appointed as Chief Superintendent. Major James McCudden is awarded the Victoria Cross. The last German air-raid on London. The Independent Air Force, dropped 550 tons of bombs on Germany from bases in France. The Independent Air Force constituted to become directly under the control of the Air Ministry. Three Wings were formed - the 41st consisting of Nos. 55, 99 and 104 Squadrons. The 83rd Wing with Nos. 97, 100, 115, 214, 215 and 216 Squadrons and 88th Wing with Nos. 45 and 110 Squadrons. On the night of 24/25 July, Sergeant LA Dell of 214 Squadron, the pilot of an Handley-Page 0/400 dropped the first 1,650lb SN bomb on Middlekerque. The first American-built Airco (de Havilland) DH4s go into operational service flying an observation patrol from Ourches with the US 135th Corps Observation Squadron. The London Air Defence Area control and reporting system declared operational. The LADA central operations room was established at Spring Gardens, near Admiralty Arch, London. Reports from anti-aircraft gun sites, observation posts, sound locators and searchlight sites were displayed on a squared map fixed to a raised dais. Ten plotters transferred the incoming information with different coloured symbols and discs onto maps and a vertical plotting chart. Sopwith Cuckoo torpedo-carrying aircraft are embarked on HMS Argus, which had been converted from the Italian liner Conte Rosso into an aircraft carrier. Trenchard appointed Commander-in-Chief of the inter-Allied Air Force. This comprised of British, French, Italian and American bomber type aircraft. By late 1918, 27 Aeroplane Acceptance Parks were in operation for the final assembly and acceptance of new aircraft from the factories before delivery to the operational squadrons. A number of Aircraft Repair Depots were also built geographically, to carry out major repairs to Service aircraft. Lieutenant RE Keys pilots a Sopwith Camel in an experiment in which it is released from beneath the R23 airship at 3,000 feet. Hostilities ceased at 11 o’clock. The Royal Air Force at the end of the First World War numbered 30,000 officers and 350,000 other ranks. The first-line strength of the RAF was 3,300 aircraft and 103 airships. The ‘Ten Year Rule’ was laid down when Lloyd George’s War Cabinet decided in 1919, that ‘it should be assumed, for framing revised Estimates, that the British Empire will not be engaged in any great war during the next ten years’. The Committee of Imperial Defence (now reviewing the rule annually) reaffirmed the 10-year assumption in 1929, 1930 and 1931. Sir Hugh Trenchard is re-appointed Chief of the Air Staff and Major-General Sir Frederick Sykes is made controller general of civil aviation. Mr Winston Churchill became Secretary of State for War and Air. A Department of Civil Aviation was set up with the Air Ministry. The R.33 airship built by Armstrong Whitworth is launched at the company's works at Barlow. The Air Navigation Directions, laying down rules for aircraft registration and pilot licensing, are published. The official wartime ban on all civil aviation in Britain lifted. Captain John Alcock (1892-1919) and Lieutenant Arthur Whitten Brown (b1886) flew non-stop from St. John’s Newfoundland, to Glifden, Ireland in a Vickers Vimy biplane in 15 hours, 57 minutes - a distance of 1,960 miles. German Navy crews scuttle seven airships to stop them falling into allied hands. The Peace Treaty is signed in Versailles; it prohibited Germany to have an air force or produce military aircraft. Under Article 198 of the Treaty of Versailles, a set of rules was drawn up dealing with German aviation, to deprive Germany of all air power. These were known as ‘The Nine Rules’. London’s first airport at Hounslow Heath complete with customs facilities opens for international flights. The British rigid Airship R34, left East Fortune, Scotland and landed at Mineola, Long Island after a voyage of 108 hours 12 minutes. The return voyage a few days later was made in 75 hours 3 minutes. Britain's most successful air ace Major Edward 'Mick' Mannock, who made 73 accredited 'kills' is posthumously awarded the Victoria Cross. Supermarine started seaplane services from Bournemouth Pier to Southampton and the Isle of Wight ,using Channel Mk 1s (NB the date is given as 16 August 1919 by some sources). The Aircraft Transport and Travel company made aviation history by starting a regular passenger and freight service between London (Hounslow) and Paris (Le Bourget). The first post-war Schneider Trophy Contest (the second in the series), was held at Bournemouth with 6 competitors from France, Great Britain, and Italy. South Eastern Area and South Western Area Commands were replaced by Southern Area Command with its headquarters at Hillingdon House, Uxbridge. A Convention was signed in Paris for the purpose of applying certain rules about international air navigation. In Britain during 1920, the Air Navigation Act was passed - to enable British enterprise into the French Convention. Among other details of the Act, provision was made for the Licensing, inspection and regulation of aerodromes. Also access to aircraft factories for the purpose of inspecting work in progress was another important part of the Act. Keith and Ross Smith took off from Hounslow, Middlesex for the first stage of the first flight to Australia. They landed in Australia on 10 December, 27 days, 20 hours after leaving Hounslow. The Meteorological Office came under Air Ministry Control. Air Chief Marshall Sir Hugh Trenchard presented his White Paper outlining the form of the new service should take and the duties it should perform. Only 25.5 squadrons were retained for the post-war RAF. Of these, Trenchard had decided to base 19 overseas: Egypt seven, India eight and three in Mesopotamia. A single bomber squadron commanded by Group-Captain R Gordon flew from Cario to British Somaliland, to attack the forces of the ‘Mad Mullah’. The Mad Mullah had been carrying out violent raids on villages all over Somaliland. The successful raids by the RAF and the subsequent occupation of the forts and camps by an Indian battalion of the King’s African Rifles, helped to justify the retention of the Royal Air Force. The first flight from London to South Africa took place when Lieutenant-Colonel HA Van Ryneveld and Flight Lieutenant. CJ Quiton Brand flew a Vickers Vimy called ‘Silver Queen’ from Brooklands to Cairo on the first leg of the journey. A total of 6,281 miles in 92 hours 58 minutes flying time. By this date, the total uniformed strength of the RAF had been reduced to 29,730. Croydon Airport commences operations as London's main airport, taking over from Hounslow. To control all UK military flying training, Inland Area was formed out of Northern Area and Southern Area Commands. The headquarters established at Hillingdon House, Uxbridge and Henlow became Inland Area Aircraft Depot. The post-war RAF Training Schools were re-designated as Flying Training Schools (FTSs). The Vickers R.80 designed by Barnes Wallis, makes its first flight. The Sopwith Aviation Co. went into voluntary liquidation. HG Hawker Engineering Co. Ltd. was registered with £20,000 capital. Its directors were FI Bennett, HG Hawker, TOM Sopwith, Fred Sigrist and VW Ere. An aircraft factory was set up in the former Sopwith Aviation Works at Canbury Park, Kingston-upon-Thames. On 9 December 1920, the Navy, Army and Air Force Institutes (NAAFI) was incorporated under the Companies Act 1908-17 as a company limited by guarantee and as an association not for profit [Limited was omitted from the title]. The official birthday was 1 January 1921, the day on which it started operations. Harry Hawker while flying a Nieuport Goshawk, haemorrhaged and died while carrying out a tight turn during a practice flight for the Aerial Derby. Cambridge wins the first air race between Oxford and Cambridge universities, using SE5as. The Vickers Vernon, the first aircraft designed as a troop carrier, is delivered to the RAF. The overall responsibility for air defence in 1922, was transferred from the War Office to the Air Ministry. The Royal Air Force Staff College opened at Andover with Air Vice Marshall Sir Robert Brooke-Popham as Commandant of the College. The formation of the RAF Reserve is announced. Lloyd George announced that the Government had approved Air Ministry plans for a force of 500 aircraft. The Turkish Army under Kemal, forced the Greeks out of Anatlia and were marching along the Sevres Treaty natural zones towards Constantinople. The Turks had halted close to the Allied positions at Chanak. The RAF troopship Braemar Castle was sent to Chanak, but the crises ended peacefully with the Pact of Medina. Captain FL Barnard pilots his de Havilland DH4A from London Croydon to Renfrew and back averaging 123 mph to win the first post-war King's Cup Air Race. The RAF became formally responsible for the security of Iraq. As joint War and Air Minister, Mr Churchill decided at the 1920 Cairo Conference, to hand over the control of Iraq to the RAF. This decision was to go far towards helping the continuance of the policy in retaining an independent air force. A Dornier Komet lands at Lympne, the first German aircraft to land in England since the end of WWI. Signor Mussolini amalgamated air sections of the Army and Navy to create the modern Italian Air Force. During 1923, the Gloustershire Aircraft Company Ltd purchased from the Government, the aerodrome and buildings at Brockworth, Gloucester. Due to non-payment of reparations by Germany, the Prime Minister, M. Poincare, in an attempt to enforce the payment, sent in French troops to occupy the Rhur basin. The British Government, alarmed at a possible clash with the French over the Rhur, decided that a Home Defence Air Force of sufficient strength to protect against an air attack by the strongest air force (the Armee de l’Air) within striking distance of this country. A committee under Air Commodore JM Steel of the Air Ministry and Colonel WB Bartholomew of the War Office devised a home defence plan. This consisted of a defensive ring of RAF fighter stations around the capital, some 15 miles deep called the air fighting zone. Inner and outer defensive belts called artillery zones were also provided for the defence of London with anti-aircraft guns. An early warning system of sound locators and observer posts were positioned along the coast. A joint sub-committee was set up under Air Commodore JM Steel and Colonel WH Bartholomew. This was to study air defence based on the nine fighter squadrons proposed by the Government. The terms for the gradual expansion of the RAF at Home were worked out by Brook-Popham and Philip Game. Land for new airfields and depots were surveyed and a start was made on site plans and building designs. RAF Reserve of Air Force Officers formed. The Cabinet approved an air expansion scheme for 52 fighter and bomber squadrons. This allowed for ten fighter sectors and 17 fighter squadrons. During October the RAF's first new fighter since WWI entered service. This was the Gloster Grebe. A prototype of the de Havilland DH.53 Humming Bird makes its first flight at the company's works at Stag Lane; it had been prepared to compete in the forthcoming Daily Mail Motor Glider Competitions. The Government announced its decision to build two airships, the R100 and R101, both of 5,000,000 cu.ft. capacity. A committee was set up under Major General CF Romer to study command, early warning and communications. Lord Thompson becomes the Secretary of State for Air in Britain's first Labour government. Imperial Airways formed as the ‘chosen instrument’ of the British Government to develop British commercial air transport. on an economic basis. Four companies, Daimler Airways Ltd., Handley Page Transport Ltd., Instone Air Line Ltd. and British Marine Navigation Ltd. were amalgamated to form Imperial Airways Ltd. The Fleet Air Arm of the RAF was formed in 1924. Following RAF intervention in British Somaliland and during the Chanak Crises, the new Service was seen as being highly successful in carrying out a number of policing operations abroad. This was carried out with great efficiency, at low cost and practically with no loss of life. This further consolidated the case for the RAF to be considered as a Service in its own right. Turkish troops crossed the Iraq north-west border and moved towards the town of Amandia. The local RAF Commander ordered his squadrons to attack. The result was several hundred Turkish casualties and their subsequent withdrawal. Air Defences of Great Britain (ADGB) introduced under the command of Sir John Salmond. Alan Cobham lands the prototype de Havilland DH.60 Moth after flying 1,000 miles to Zurich and back in a single day. The first four auxiliary squadron were formed - No. 600 (City of London), No. 601, (County of London), No. 602 (City of Glasgow) and No. 603 (City of Edinburgh). No.1 Apprentice Wing, RAF was established at Halton. The Locarno Treaties - a pact of non-aggression were negotiated and eventually signed whereby Belgium, the eastern frontiers of France, and the western frontiers of Germany, were guaranteed against invasion by the Governments of Great Britain, France, Germany and Belgium. The Holt Autochute is publically demonstrated for the first time at Stag Lane. A small 'pilot' parachute pulls the main chute out of the pack. Deutsche Lufthansa - the German airline company formed. The HP W.10 airliner makes its maiden flight from Cricklewood in the hands of test pilot Hubert Broad. Juan de La Cierva sets up Cerva Autogiro Company Ltd. The Paris Air Agreement of 1926 withdrew the limitations on the construction of civil aircraft in Germany. While the DH.66 airliner is still under construction, its type name is decided by a competition in Meccano Magazin: the winner is a schoolboy, EF Hope-Jones of Eton College, who suggested the name 'Hercules'. Imperial Airways introduces a new airliner, the Armstrong Whitworth Argosy, into service on the London / Paris route. Avro test pilot Frank Courtney flies the Avro Type 587 (Cierva C.6D) two-seat autogyro on a short flight with Juan de La Cierva as passenger - this is the first passenger flight in a rotary-winged autogyro. The duralumin-hulled Short Singapore flying boat, built for the Air Ministry, makes its first flight from Rochester, piloted by John Lankester Parker. The de Havilland DH.66 Hercules makes its first flight, piloted by Hubert Broad. The Gloucestershire Aircraft Company changes its name to Gloster. Imperial Defence College opened in London. In order for the Gloster Aircraft Company (GAC) to expand into all-metal aircraft design and production, the Steel Wing Company was absorbed into GAC. All plant and staff were transferred from London to the factory at Brockworth. Later, work was also taken away from the old GAC factory at Sunningend, Cheltenham, to centralise production at Brockworth. A contract was awarded to the Cleveland Bridge & Engineering Co. Ltd for the dismantling of the No.2 airship shed at Pulham, its re-erection at Cardington and the necessary extensions. This projected was completed by 1 January 1929. At the Hendon Air Pageant of 1927, saw the first public appearance of a new series of 12-cylinder liquid cooled Rolls Royce aero-engine. In 1931 it became known as the Kestrel to conform with the Rolls Royce tradition of calling new piston engines after birds of prey. Lady Bailey establishes a new light aircraft altitude record of 17,283 feet in a DH.60 Moth at the company's airfield at Stag Lane. The first tactical exercises of ADGB took place which involved the whole of RAF Fighting and Bombing Areas and the ground forces of the London defences. Flight-Lieutenant SN Webster won the 1927 Schneider Trophy in Venice. The reconstructed RAF station at North Weald officially opened. The reconstructed RAF station at Upper Heyford officially opened. Sir Alan Cobham [1894-1973] flew from Rochester in a Short Singapore I, an all-metal biplane flying boat, powered by two 700 hp Rolls Royce Condor engines on the first leg of a 20,000 mile reconnaissance flight round Africa. . The reconstructed RAF station at Bicester officially opened. The new Short S.8 flying boat, makes its first flight with pilot John Lankester Parker at Rochester. At Croydon, the new multi-functional terminal and airport was officially opened to become the first permanent purpose-built air passenger terminal for scheduled air services in Britain. Lady Heath lands her Avro Avian at Croydon to complete the first solo flight from South Africa to Britain: she left Cape Town on 12 Feb.
As a publicity stunt, an Imperial Airways AW Argosy piloted by Gordon Olley races the London and North Eastern Railway's Flying Scotsman train, the 390 miles from London to Edinburgh; the Argosy takes 84 minutes to refuel twice en route and beats the train by 15 minutes. The French Air Service had been in two parts, as sections of the Army and Navy, but in 1928, the French Air Ministry was created to control the independent Armee de l’ Air. Alliott Verdon-Roe sold AV Roe & Co. Ltd to Sir Armstrong Whitworth & Co. Ltd.
December marked the beginning of the evacuation by air of 586 men, women and children from Kabul in eastern Afghanistan following its isolation by rebel tribes. The AOC-in-C of the Air Defence of Great Britain, Air Vice-Marshall Sir Edward Ellington, recommended that a balloon barrage should form part of the defence of London. The combined interests of Verdon-Roe and SE Saunders Ltd founded in 1929, the firm of Saunders-Roe Ltd. of Cowes, Isle of Wight. Alliott Verdon-Roe was knighted in 1929. Air Commodore EAD Masterman became the first commandant of the Observer Corps. When it was formed in 1925, its ,members were special constables detailed for aircraft observation and came under the War Office. In 1929 the corps were taken over by the RAF. Imperial Airway's Handley Page W.10 City of Ottawa crashes into the sea killing four. Up to now the HP fleet has flown 3.9 million miles without injury or fatality to any of its passengers. Flying-Officer HRD Waghorn in the S6 experimental seaplane won the Schneider Trophy. At Northolt, Norman Macmillan pilots the Fairey Fox II light bomber on its first flight. HRH Prince George officially opens Hull [Hedon] Municipal Aerodrome. Kingston-upon-Hull was only the second British City to acquire a municipal aerodrome. The airport opened just four months after Manchester (Wythenshawe). The R100, built by the Airship Guarantee Co. Ltd made its maiden flight from Howden to Cardington. Air Chief Marshall Sir John Salmond appointed Chief of the Air Staff, in succession to Marshall of the RAF Lord Trenchard. The organisation of the RAF at home in 1930 comprised three main commands, namely: Air Defence of Great Britain, the Inland Area and the Coastal Area. The command of ADGB was divided into two areas, Fighting Area, Wessex Bombing Area and No.1 Air Defence Group. The British rights for the manufacture of Junkerswerke Lamellendach - to be known as Lamella segmental roofs - were secured by the Horseley Bridge and Engineering Company Ltd. of Birmingham. The first British hangar to be erected - at Heston - was in May 1930. The Prince of Wales formally opens Ipswich Municipal Aerodrome. HRH Prince George on the occasion of the company’s 21st Birthday formally opened Handley Page’s new aerodrome and factory at Radlett. During the ceremony, Tom Harry England demonstrates the ability of the HP Gugnunc to make a quick take-off: he starts the aircraft's engine inside the hangar, and is airborne as he passes through the doors. Radlett had actually been in use since 12 June when Jim Cordes made the first flight of the HP 38 Heyford bomber. R101 crashes at Beauvais, France with the loss of 43 lives. John Lankester Parker makes the first flight of the prototype Short S.17 Kent flying boat, from the River Medway. The Iraqi Air Force makes its inaugural flight when five military de Havilland Moths flown by the first British-trained Iraqi pilots, leave Hatfield for Baghdad. The new Municipal aerodrome at Blackpool, (Stanley Park) was officially opened by the Prime Minister. The main feature of the airport was the unique design for its clubhouse. This was used by the National Flying Services who managed the aerodrome on behalf of Blackpool Corporation. HRH Prince George officially opens Stoke (Meir) Municipal Airport. James Allan Mollison (1905-1959) took off from Australia in a de Havilland Gypsy Moth and covered the 10,000 miles to England to establish a new record in eight days 19 hours 25 minutes. Flying a Supermarine S.6B, Flight Lieutenant John Boothman, in the absence of any contenders, completed the course at 340.8 mph to win the Schneider Trophy outright for Britain. At Calshot Flight Lieutenant George Stainforth sets a new World speed record in the Supermarine S.6B seaplane; over six circuits of a set course he achieves an average speed of 407.5 mph. At the suggestion of the Prime Minister, the Secretary of State for Air approached the Royal Fine Art Commission, to advise on how to improve the artistic and architectural effects of RAF buildings. The Commissioners consisting of Professor SD Adshead, Sir Reginald Blomflied, Sir Edwin Lutyens and Sir Giles Scott decided to visit on 3 November 1931, two typical stations in the Oxford area - Abingdon and Upper Heyford. The M.2 submarine, which could carry a seaplane sinks with the loss of the entire crew. Following the aggression of Japan in Manchuria, the Chiefs of Staff recommended with the approval of the Committee of Imperial Defence and the Cabinet, to abolish the 10 Year Rule. Eustace Short, one of the three founders of Short Brothers, dies of a heart attack, just after landing his Short Mussel seaplane at Rochester. Cyril Uwins flies a Vickers Type 210 Vespa Mk.VII to a World record altitude of 43,976 feet. Amy Johnson lands her DH 80A Puss Moth Desert Cloud, after a flight of 7 days 7 hours 5 minutes from South Africa. During January 1933 engineers at Rolls Royce started on the design of a new standard aero engine initially called PV 12 (Private Venture) it later became known as the Merlin. Adolph Hitler named as Chancellor of Germany. Fairey's TSR1 torpedo spotter-reconnaissance aircraft makes its maiden flight at Harmondsworth (Heathrow). Sir Frederick Henry Royce Bt, OBE, MIME & MIAE, died at his home at West Wittering, Sussex. Liverpool Airport [Speke] was officially opened by the Secretary of State for Air, Lord Londonderry. Wessex Bombing Area of ADGB was split into two parts, namely, Western Area and Central Area. Sixteen towns and cities had licensed aerodromes: Blackpool, Bristol, Cardiff, Ipswich, Nottingham, Leeds-Bradford, Plymouth, Liverpool-Speke, Portsmouth, Hull, Manchester, Renfrew, Inverness Norwich, Southampton and Stoke. Five towns had purchased sites before the end of October 1933: Carlisle, Doncaster, Leicester, Southport and Walsall. German withdrew from the Disarmament Conference and the League of Nations. The Croydon Controlled Zone came into being. This was the first of several zones surrounding major airports where during conditions of poor visibility aircraft were not allowed to enter the zone without first obtaining permission from the control tower. The idea was to allow only one aircraft into the zone at a time to eliminate any possibility of a collision. To meet the demand for new RAF stations, an Air Ministry Aerodromes Board was formed within the Air Ministry Works Directorate. RAF Expansion Scheme ‘A’ adopted by Parliament, called for a front-line strength of 1,5rr aircraft within 5 years. Leonard Reid and James Ayling land their DH 84 Dragon at Heston after the first non-stop flight from Canada; their flying time was 30 hours 50 minutes. The RAF Cadet College, Cranwell officially opened. The first de Havilland DH.88 Comet, ordered by Jim and Amy Mollison for the MacRobertson air-race to Australia, makes its maiden flight. At 6.30 am, The London to Australia Air Race was officially started by Sir Alfred Bower, the acting Lord Mayor of London. The first to cross the finishing line at Melbourne was the de Havilland Comet ‘Grosvenor House’, flown by CWA Scott and T Campbell Black. The flight had covered 11,300 miles in less than 72 hours at an average flying speed of 176.8 mph. Sites had been selected in 1934 of the first nine new RAF stations at home and construction commenced in 1935 at Marham, Feltwell, Cranfield, Thorney Island, Harwell, Stradishall, Ternhill, Waddington and Church Fenton. For the first time, a long-range striking force was to be based in the eastern half of the country - East Anglia, Lincolnshire and Yorkshire. Also a continuous system of fighter defence was to be extended from Southampton, east and north to Newcastle. The first practical radar demonstration by Watson-Watt took place at the Daventry radio station. He showed that there was sufficient energy produced by an aircraft while flying in the Daventry 50-metre radio beam to register as an interference on his instruments. The Percival Gull makes its maiden flight. The first of the Elementary Reserve Flying Training Schools set up to relieve RAF Flying Training Schools of the preliminary flying training. The Air Ministry awarding contracts to civilian companies already experienced in flying training to undertake this task. King George V, as Chief of the Royal Air Force, came to Mildenhall and Duxford for the first ever full Review of the Royal Air Force. The Vickers company is awarded an AM contract for a total of 96 monoplane bombers with the type name Wellesley. The first flight of the prototype Hawker Hurricane. RAF Expansion Scheme ‘F’ - replaced Scheme ‘C’ before it was completed. Scheme ‘F’ allowed for 124 squadrons with 1,750 front-line aircraft. For the first time provision was made for aircraft to be held in reserve. This led to the setting up of Aircraft Storage Units on existing Flying Training Schools. The Secretary of State for Air, Lord Swinton announced the building of State-owned shadow factories. These were to be managed by motor car manufacturers, to initially produce aero-engines and later of aircraft designed by other companies. Five firms were allocated to the Air Ministry: Austin Motor Co. Ltd., Daimler Co. Ltd., Rootes Securities Ltd. (Humbers), Rover Co. Ltd. and the Standard Motor Co. Ltd.
Frank Whittle sets up Power Jets, with a capital of £10,000, to develop a turbojet engine. Hitler’s statement made at the end of March to British Ministers that the German Air Force had reached parity with the RAF, was disclosed by UK Government. The Air Council reviewed the system of command and administration prevailing in Home Commands. As a result the ADGB, with its three sub-ordinates, the Wessex Bombing Area, the Fighting Area, and No. 1 Air Defence Group, Coastal Area and Inland Area, were all disbanded. Instead, the first four new commands, each with an Air Officer Commanding-in-Chief were formed. Training Command, Bomber Command, Fighter Command and Coastal Command. Air Marshal Sir Charles Burnett was appointed AOC-in-C Training Command. Air Chief Marshall Sir John Steel was appointed as AOC-in-C, Bomber Command. Air Chief Marshall Sir Hugh Dowding became AOC-in-C Fighter Command. The first flight of the prototype Supermarine Spitfire (K5054) took place at Eastleigh (Southampton Airport), piloted by ‘Mutt’ Summers. Italian annexation of Abyssinia was announced. A grass aerodrome beside the London / Brighton railway is officially opened at Gatwick, although it had been in use since 1930. The Barnes Wallis-designed Vickers B.9/32 bomber (Wellington) makes its maiden flight piloted by 'Mutt' Summers at Brooklands. The Royal Air Force Volunteer Reserve formed to provide a source of additional pilots. The King’s Cup Air Race in Britain was won by Charles Gardiner on a Vega Gull at an average speed of 164.5 mph. RAF stations, Driffield, Finningley and Wyton open. The Johannesburg Air Race stared from Portsmouth Airport. There were nine entries. The winner, and only finisher was a Vega Gull crewed by Charles Scott and Giles Guthrie. 1937 - During the year, the first four balloon depots for the defence of London were planned and built at the following sites: No.1 Kidbrooke, No.2 Hook, No.3 Stanmore and No.4 Chigwell. 1937 - Construction commenced on the first Universal Equipment Depots at Hartlebury and Carlisle. Altogether six new depots were built so as to supply certain geographical areas. They were operated under the control of No. 40 Group. Each was organised on a universal basis and held the complete range of aircraft components and ground equipment, from a complete aircraft engine to a split pin. . The Maybury Committee on civil aviation which had been appointed by the Government in July 1935, under the chairmanship of Brigadier General Sir Henry Maybury, published its report. The prototype B.24 Skua two-seat fighter / dive-bomber makes its maiden flight, piloted by 'Dasher' Blake of Brough. The new Air Registration Board formed under the chairmanship of Sir Maurice Denny. Various functions were delegated to it, including the survey of aircraft in relation to renewal of Certificates of Airworthiness. The 'Flying Duchess', 72 year old Mary, Duchess of Bedford, goes missing in a snowstorm after taking off from Woburn in her de Havilland 60 Gipsy Moth to view the frozen fens. RAF stations, Church Fenton, Debden, Linton-on-Ouse and Marham open. The first test run of a gas turbine engine to the designs of (Sir) Frank Whittle (1907-1996), took place at the British Thomson-Houston factory at Rugby. Frank Whittle’s first gas turbine engine, the ‘U’ type was first tested on the ground. The first operational radar-chain station at Bawdsey Manor, was handed over to RAF personnel to become the first prototype radar station. RAF stations, Cranfield and Scampton open. R J Mitchell was responsible for the design of the Spitfire - the county's most famous aircraft. Southampton Docks. The first flying boat service to Durban operated by Imperial Airways, using 'C' class Flying boats departed on this date from a pontoon base at Berth 101 in the Western (New) Docks. Flt Lt MJ Adam flies his Bristol 138 to a World altitude record of 53,937 feet; the cockpit canopy cracks but he is saved by his pressure suit. The first experimental ‘filter room’ - to receive data from the radar stations and to sort through this information in order to establish the correct position of aircraft - was established at Bawdsey Manor. The Bawdsey Research Station had been responsible for all experimental work in connection with operations covering the use of RDF, including filter development. The first experimental filter room was installed there in July; its main feature was a map-table covering the approaches to the Thames Estuary. On this were plotted reports of aircraft positions as received by telephone from RDF stations at Bawdsey, Canewdon and Dover. At Hythe a Pan American S-42B ‘Clipper II’ arrived at the commencement of transatlantic services. A committee comprising of Lord Halifax, Oliver Stanley and Sir Thomas Inskip, recommended in their report to the Cabinet, full control by the Admiralty of the Fleet Air Arm. After a long fight the Royal Navy takes control of the Fleet Air Arm from the RAF. The prototype Boulton Paul Defiant fighter, with a four-gun turret makes its maiden flight. Jean Batten arrives at Lympne in her Percival Gull, Jean, setting a new speed record of five days 18 hours and 15 minutes over the route from Australia to England. Ernst Udet, Director of the Technical Department at the German Air Ministry, General Milch and General Stumph visited the Shadow Factories. Visits to RAF stations included Andover, Cranwell, and Mildenhall. Betty Kirby-Green and Arthur Clouston at Croydon land their DH.88 Comet, The Burberry, after flying to South Africa and back in 5 days 17 hours 29 minutes, knocking four days off the previous record held by Amy Johnson. Discussions took place of the setting up of Military Area Control Centres to control en-route air traffic, led to the formation of Regional Control Organisations on new RAF stations. 1938 - The Air Defence League inaugurated to provide for reserves of partly-trained young men with some knowledge of aviation. The age limits were between 14 and 18 and units were to be established in all major towns and cities. A typical unit or squadron was to consist of 100 cadets. This was the beginning of the Air Training Corps. The Air Ministry announced that RAF display Hendon was to be discontinued as Hendon was deemed as too small for modern aircraft. Squadron Leader Gillan lands at Northolt after a flight from Turnhouse in the new Hawker Hurricane at an average speed of 408 mph. The seaplane Mercury and flying boat Maia, together forming the Short Mayo composite aircraft, were successfully separated in a flight at Rochester. Hitler gives orders for the occupation of Austria by German forces. Arthur Clouston and Victor Ricketts land their DH 88 Comet Australian Anniversary at Gravesend to complete a 26,500 mile flight from England to New Zealand and back in a record 10 days and 21 hours. RAF Expansion Scheme ‘L’ replaces Scheme ‘F’ but is quickly replaced by Scheme ‘M’. The Air Minister, Sir Kingsley Wood approached Lord Nuffield (whose Nuffield Organization had declined not to take part in the aero-engine shadow scheme), to construct and run on behalf of the Air Ministry an aircraft factory. A 345 acre site was found at Castle Bromwich and was completed by June 1940. Before full production of Spitfire aircraft could get underway, the management of the factory was taken over by Vickers Armstrongs. The Government announces that it had decided to order from the United States, 400 aircraft made up of 200 Lockhead Hudsons and 200 North American Harvards at an estimated cost of £5,400,000. Sir Kingsley Wood, Secretary of State for Air, opened Manchester’s new municipal airport at Ringway. Southampton Marine Terminal. Two 'C' class flying boats departed on first scheduled service to Australia. The King’s Cup Air Race flown over a triangular course in Britain was won by Alex Henshaw on a Percival Mew Gull at an average speed of 236 ¼ mph. The formation of the Civil Air Guard was announced by Sir Kingsley Wood, Secretary of State for Air. Men and women, who joined CAG and undertook, in the event of a national emergency, to offer their services to the RAF, were given flying training art reduced rates. Agreement signed in Munich, between Germany, Britain, France and Italy, allowing Germany to occupy Sudeten German territories in Czechoslovakia. The prototype Westland Whirlwind single-seat fighter makes its maiden flight. As a result of expanding the balloon barrage to include other cities outside London, Balloon Command formed under the command of Air Vice Marshall Boyed. RAF Expansion Scheme ‘M’ replaces Scheme ‘L’ for 2,550 aircraft to be completed by 31 March 1942. The first Group Pools were formed to provide advanced training on modern aircraft for pilots and crew as a team prior to joining operational squadrons. 1939 - Flying Training Schools become re-designated as Service Flying Training Schools. Creation of the Ministry of Supply. John Lankester Parker pilots the prototype Short Stirling on its first flight. The plane was wrecked in a landing accident on 2 August 1940. The Women’s Auxiliary Air Force formed when 48 companies of the Auxiliary Territorial Service are transferred from the Army to the RAF. The Avro 679 Manchester heavy bomber makes its maiden flight. The Cabinet initiated various confidential measures scheduled for an emergency and RAF units received orders to mobilize to war conditions. The next day the beginning of the mobilization of the twenty Auxiliary Air Force squadrons and Volunteer Reserve took place. Germany invaded Poland. Britain and France demanded the withdrawal of German troops from Poland. Complete mobilisation was ordered. Orders for a ‘black out’ throughout Britain from sunset were issued. Ten Fairey Battle squadrons of the Advanced Air Striking Force flew to France. The Royal Aero Club had issued 20,048 Flying Certificates up to the outbreak of WWII. France and Great Britain in accordance with Treaty Obligations against aggression, declare war on Germany.